Because I'd gotten enough rest yesterday, I was rather alert (and surprisingly not grumpy) this morning when Mari woke up. She let me sleep in and didn't start stirring until 6:30 to be fed. I nursed her and afterwards held her body tightly in my arms. She's always been so loveable and huggable, but lately it seems like she's "hugging" back. She grips a little tighter and will wriggle in my arms making herself comfortable until she finds the right spot. When I'm laying down, and I find that perfect spot, I call it my angel spot because I feel so safe and comfortable like I'm in the arms of an angel. Seeing the utter look of relaxation on her face, I know when Mari finds her "angel spot." Most times, when she's fighting the sleep, she'll look up at me with those beautiful hazel eyes and just stare. It's a calm inquisitive stare. Her tiny hands explore my face, like a blind person seeing me for the first time. It's very serene and gentle and it is these exact moments that melt my heart and make it oh-so-difficult to leave for work, go to sleep, or let her out of my sight for even a moment. Anyway, she does exactly like Mommy...wants to sleep on her belly. I put her in there and she'll roll over to her side, then finally on her belly. It doesn't matter how many times I move her to go to her side, she will always go to her belly. I'll put things in her way so she won't roll over, but she'll roll on top of them, wrestle them down and sleep on top of them if she has to. Her hands also have to be touching something. Here she is in her crib. You can see Sock Zebra underneath her. He starts out next to her, but she'll roll over on top of him if necessary and stretch out her left hand to touch Ty. Ty is my teddy bear that My Michael gave to me when we were growing up. Ty has very, very, very special meaning to me and instead of seeing him on the shelf, I've placed him in Mari's crib. She loves wrestling with Ty, holding onto his leg, and running her fingers over his outside to feel the texture. Anyway, this is the way she sleeps. Every night, in the crib, on her belly. I'll cover her up with her blanket and even put socks on her at night so she won't get cold, but it doesn't matter. 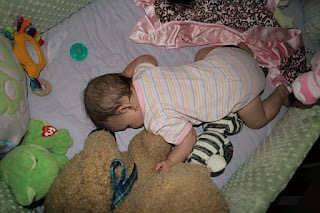 She'll roll over, kick the blanket off, and have at least one sock kicked off, if not both. It is so hard to believe how much she's growing and changing. It really is remarkable! When I get home from work, I'll remark on something and tell Don, "Quick, quick, come see this!" I'm overly excited and he'll come and let me have my moment of oh-wow-she's-the-smartest-kid-ever-because-she-did-______. I know, though, that he's probably already seen the trick and I'm jealous, but I'm glad he humors me and plays along and lets me have my mommy moment. I'm lucky to have a wonderful partner and friend who is THAT understanding of my quirks. I'm doubly lucky to have this opportunity to be a mother. I'm so glad that God blessed me with Mari. Oh, I have those angel spots too. You write so beautifully about things! There is nothing better than a snuggly baby. They learn so much that you don't realize they are learning. Last night we asked Braelyn where the fan was and she pointed to it. So we kept asking and she kept doing it. We were like "When did she learn to do that??? She's so smart! She knows what a fan is and can POINT to it!!" 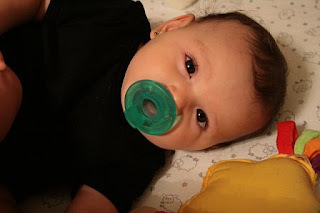 She grabbed the paci! Awww...she's getting to be a big girl now.